Keeping your children safe around the pool is very important as they can be careless and something might happen while you are not watching. In order to avoid any injuries or even serious problems it is best to install a few features that will help you keep your pool area safe not only for children but for anyone being around. You should keep in mind that you can only do so much to protect your children and others, but that the others should know proper pool safety as well; at least until they are grown up enough. Just because you have a pool does not mean that your responsibility stops there, and that whoever is going to take a swim in it should know how to behave around and in the pool. Before you let your children into the pool though, make sure to explain to them what they are, and what they are not allowed to do. Moreover, teach them what they should do if anything happens so that someone can come and help them. If your children love to run around it will be problematic to keep them away from the edge of the pool as they will inevitably run there, and chances are that one of them might slip and fall. You can always install a removal safety fence that will cover the pool area so that your children will keep out no matter what. The best thing about fences is that it is easy to put up and to take down so that when you ensure that everything is safe you can put it aside to let your kids into the pool. Make sure to lock the gate as well, so that you are sure that nobody can get in. Perhaps for your pool it is better to install either a manual or an automatic pool cover that will not only protect your pool from people and debris falling in, but it will keep it cool, or warm; depending on the weather. It is a great way to ensure that nobody falls in accidentally and that even if something does happen, they can just walk right out of it without any problems or help. On the other hand, you will have a clean pool at all times, as the dirt and debris will stay out. When you decide to build separate plunge pools, make sure that they are further from the big pool, if you plan it like that. If not, make sure that there is a small gate that will keep children away, as they will tend to try it out; and because these pools are deeper, it might be troublesome for them to get out once they fall in. 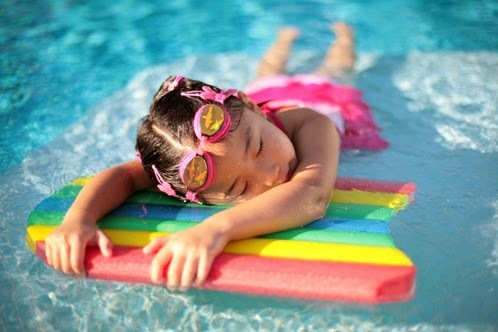 Make sure to tell your kids that this pool is off limits, at least until they are a bit older. The area around your pool is going to get wet, and in most cases it will result in slip and falls, which could not only lead to small injuries, but also a serious visit to the hospital as well. It is best to avoid fatal injuries by installing non-slippery tiles which will be able to give you a stable walking path even if wet; making sure that neither you nor your children can fall into the pool, or accidentally injure yourself. However, make sure to tell your kids to never run around the pool as it can be dangerous. 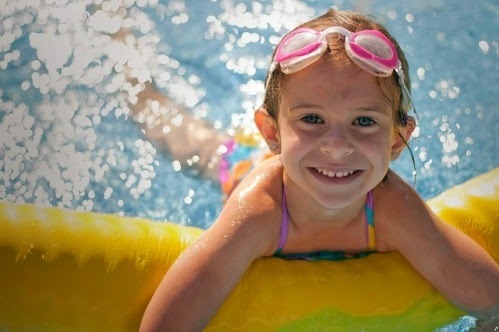 Although you can set up safety precautions to ensure that your pool area is secured and that there is almost no chance of anyone accidentally falling or getting hurt, it is only so much that you can do in order to protect your kids. However, they should be taught about the safety measures they need to take to be safe around and in the pool so that they do not hurt themselves. Moreover, teach them what they should do if anything might happen, so that they do not panic and that they will be able to call an adult for help.